New year, more new projects! I do a good bit of traveling for work and this time of year traveling in the Midwest the weather is a constant battle. 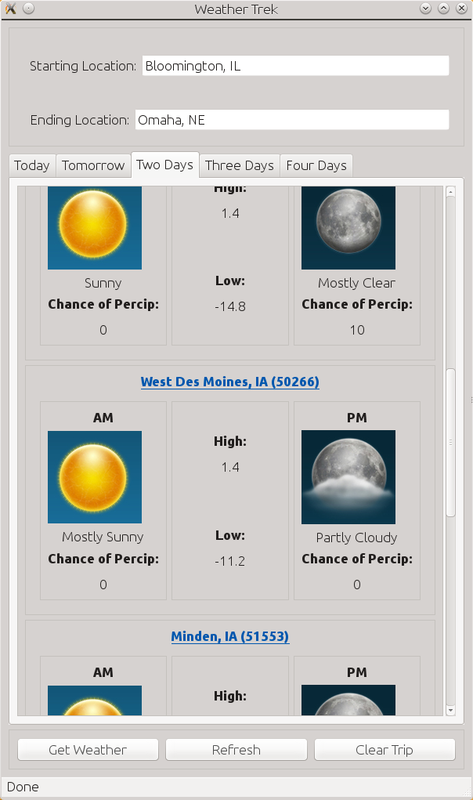 After loading up four different zipcodes on Weather.com twice a day for a few days in a row trying to get an idea of what the weather would be like while traveling on the upcoming weekend, I decided to make a simple tool to look up the information for me. Like my other projects this one is written in Python and utilizes the Qt toolkit for the GUI. You can find the source code and Debian/Windows packages on the GitHub page here. After launching the application, simply post two locations into the entries at the top and click the "Get Weather" button. Weather Trek then uses Google Maps to find the optimal route between these two cities and then looks up the five day forecast along this route on Weather.com. To get more detailed information for a particular point, you can click on the city name on any day. The GUI and functionality is currently very simple and I am open to ideas for improvements. You can post about bugs/ideas on the GitHub page. Learning how to get my Qt apps onto Android is on my TODO list. Lots to learn still!